We haven't played a house party in over 3 years!! We are very excited that Wild Pack is going to play for our dear friend Karen Hubbell (yep, the same space telescope family), she has been a friend a very long time, helped us build a boat, gone on many tours with us, joined the family for breakfast and much more. 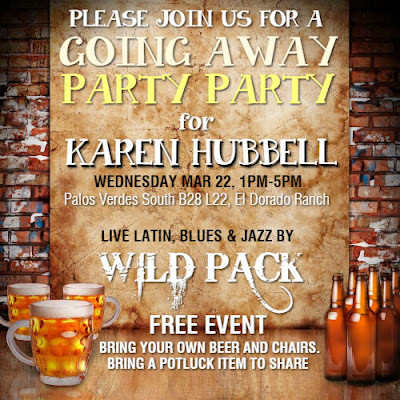 We are very sorry to see her move, although she says she will be back to visit, and we're sure she will...she will be missed and we are going to help her celebrate the next big change in her life and we hope you all can join WILD PACK in Karen's Going Away Party. This is an open jam for any musicians that wish to join us and jam. Wild Pack love to jam.